Missouri Education Watchdog: Another Assault on Homeschoolers: This time in Oklahoma. Another Assault on Homeschoolers: This time in Oklahoma. This form is being distributed to families by Claremore Public Schools. OCHEC strongly encourages parents who receive this form (or anything similar) to contact Home School Legal Defense Association (www.hslda.org). 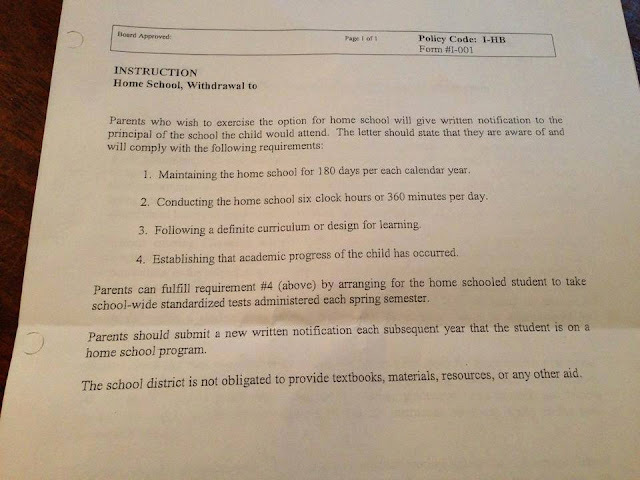 Other homeschooling Oklahoma parents take note and see if you get a similar letter from your school district. Parents in other states may want to pay attention to what arrives in their mailboxes. Why is this a problem? Why is it considered an assault? Parents who are properly and safely homeschooling and educating their children should have NO reason to hide their children or their intent. More homeschoolers should be willing to prove their children's education level and academic progress: then there would be more homeschooled children actually getting a good education instead of being neglected. Because here is the problem. One: I only schedule school for 170 days. The days that public schools take off for parent teacher confrrences and professional development days she does not get off. In the end, she goes to school more. Second: I can get the school day done in about 3 and a half hours a day since there are no interuptions from other students. Third: I design alot of the curriculum myself since my daughter is above grade level for English and Science. Fourth: Taking a test does not evaluate properly. I have always done well in school. Even had a 4.0. However, I always did bad on tests, and my daughter is the same way. And finally, It is a right to be able to educate our children how we want to! Allowing the state and governement force you to do something is just another right taken away from the parents. Anna, it is very naive to think that merely presenting a record of compliance with the law keeps you safe from the long reach of government overreach into your personal parenting decisions. It is the first, or maybe the 3rd or 4th, step into your rights to direct the education of your children. Also if you don't live in GA, don't think it won't reach you where you live. States follow states. they are all part of a big government system, working together, to reign you in. That is why HSLDA and other national homeschooling institutions watch, so closely, what takes place in each legislature. One only needs to ask, why is it so difficult and so perpetual, that we must constantly fight for our rights and freedoms in this area. 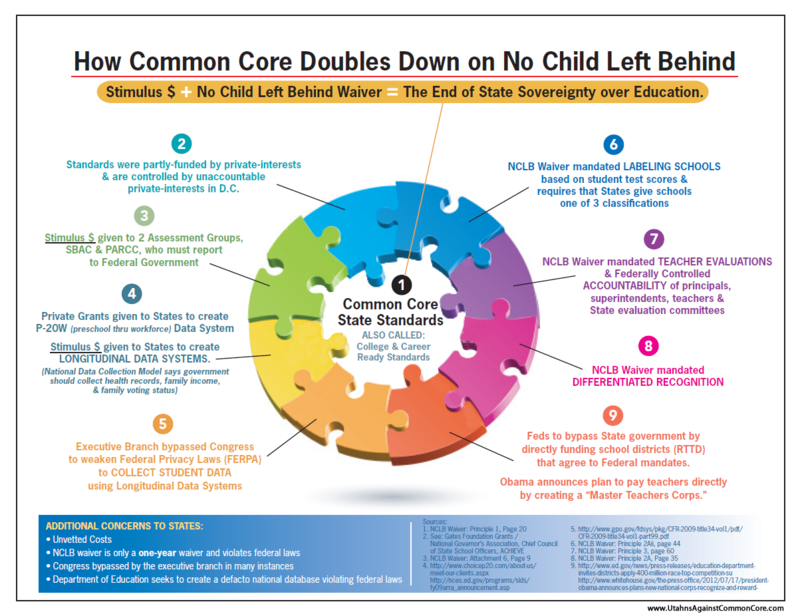 Study up on Race to the Top, Common Core, the misconception of educational choice legislation that is sweeping the country to support charter schools, school choice, etc. It's all there to erode at your liberties. Homeschoolers are the biggest threat to the agenda. It's a problem bc OK is supposed to be a state where you don't even need to notify the superintendent of your intent to homeschool. Also, why the definite curriculum requirement? What about unschoolers? Why the 6 hr. per day requirement? What if one of the reasons you wanted to homeschool was so you could move onto something different if they seemed bored instead of focusing on arbitrary time requirements? Freedom dies when the government of a nation assumes, as you seem to, Anna, that people will not do the right thing for their families unless regulated and coerced. How many homeschooled children are in reality neglected instead of educated? Why are we coming up with harsher regulations for homeschoolers who outperform public and private school kids by astounding margins? Why not have more regulations on teachers in public schools? 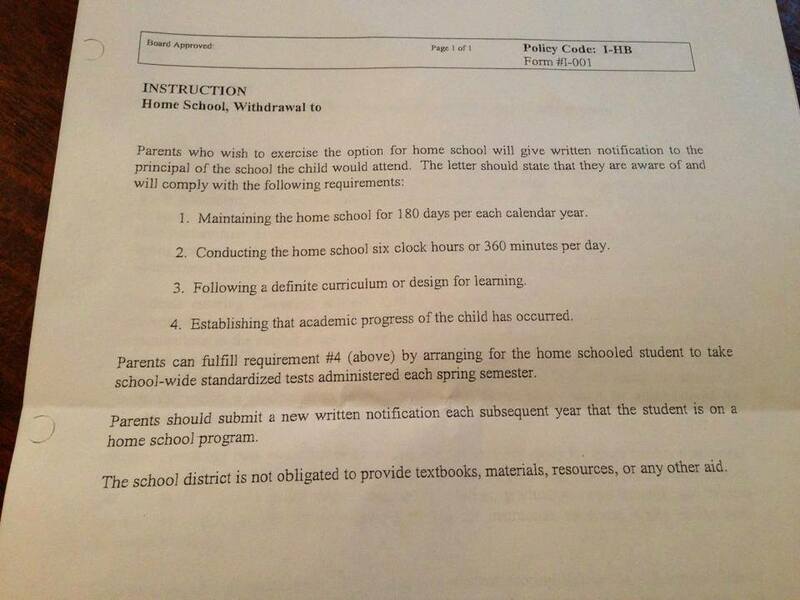 This isn't an attempt to fix homeschooling because homeschooling isn't broken. This is an attempt to exercise greater control and it will probably succeed if mindless sheep like you sit by idly while the bars to your cage are put in place in the name of "If you're not doing anything wrong, you have nothing to worry about". Public schools should be more inclined see what speed each student is learning. Then keep their interest in their class subject that is being taught. All have to do is give home schooled a test to see what they learned. This doesn't seem to be more than I do in the state of Georgia. Every year, I file a Letter of Intent to Homeschool with the state, keep attendance records and records of the curriculum I use for each class, even the ones not required by law, and my children take the California Achievement Test. The CAT isn't required for every single year (only in certain grades), but I find it useful to help me know if my kids are learning or if we need to make changes. So far, they're scoring 2-3 grade levels above the level they're supposed to be at. Perhaps the public school system should be governed by the guidelines of the home schoolers. Why? Because across the board, home schoolers rank and test higher than the publicly educated. Home schooled kids are more independent and are more likely to be leaders. And, since when do we condone government reaching into our homes and telling us how to educate our children? Would you have any concerns with the government telling you what to serve for dinner to your family and then demanding a full report? If you have nothing to hide and all your meals are perfectly nutritious, then you should be willing to comply? I am certain that you are in favor of our teachers passing testing yearly to keep their certification as teachers. That should be a minimum requiremant. It is an assault in that it is intruding on what a parent does in their own home. It is telling them that the parents have to go by the school's schedule-sorry, we homeschooled to get away from the false schedule of the school system. We sometimes schooled for 8 or more hours in one day for a few days in a row so we could take off when hubby got back from deployments. Most home schooled children score much higher than public schooled children do(you can look up the stats if you are so inclined). As for having to design and/or follow a curriculum? What happens when you discover that it isn't working? Is the school system going to make you stick with something that doesn't work for your child? I am not sorry. I have only known one(1) family that didn't do well home schooling. They weren't doing well with the public school either. I wonder what Washington's mother would think of these 'requirements'? Or Lincoln's? Allowing big brother into our homes is the first step in becoming a slave. If they have no reason to think we are doing anything wrong, why should we have to prove we are doing nothing wrong?????? While the content of this homeschool instruction does not seem outlandishly demanding on the surface, the bigger issues are those related to our freedom in educating our children how we deem best. It is not in the small print per se, but the consequences down the road. If a majority of states accept a six-hour day, then the US Department of Education can make a case to apply the requirement across the board. As any homeschooler knows, a six-hour day does not necessarily equate with a level of "education" that the form assumes. Be on guard, parents...small steps in our reduction of liberty may result in an egregious violation we didn't see coming.